This year my area (New Jersey) has been going through some odd weather. Our normally warm and dry month of June has been cooler than in past years and we already have an extra inch of rain that we don't normally get. The pattern that I recall in years past has usually been by now it would rain some almost every night/early morning and the days would be dryer with almost no rainfall. And on days after it's rained it would greatly increase the humidity, which in turn triggers most species of ants to hold their nuptial flights. This June, however, has been different. I can only recall three days so far in the whole month where lots of ants have been able to fly. Because of this it seems our native Camponotus (the common name Carpenter Ant applies to some of these) have been very much behind schedule. New Queens, pictured above with wings on, for the most part would have flown from the nests by now. But as you can see there are still a few queens present. Also present in the images are larva that will develop into next year's generation of new queens. Camponotus lay eggs in batches at certain times of the year. The generation pictured here will develop fully around the month of August. These new queens and males will over winter in the nest, in preparation for next year. Now if only the weather would correct itself the current generation of alates (winged ants) might fly sometime this year. It's hard to believe July is already here. As a final report I'll say I haven't seen the diversity of Camponotus species that I used to see in year past. Clearly the weather is effecting the genus as a whole. The invasive and imported Tetramorium species are also flying much later this year. When we finally get a good day in July we're looking at a storm of every species that's been waiting to fly suddenly taking to the sky. 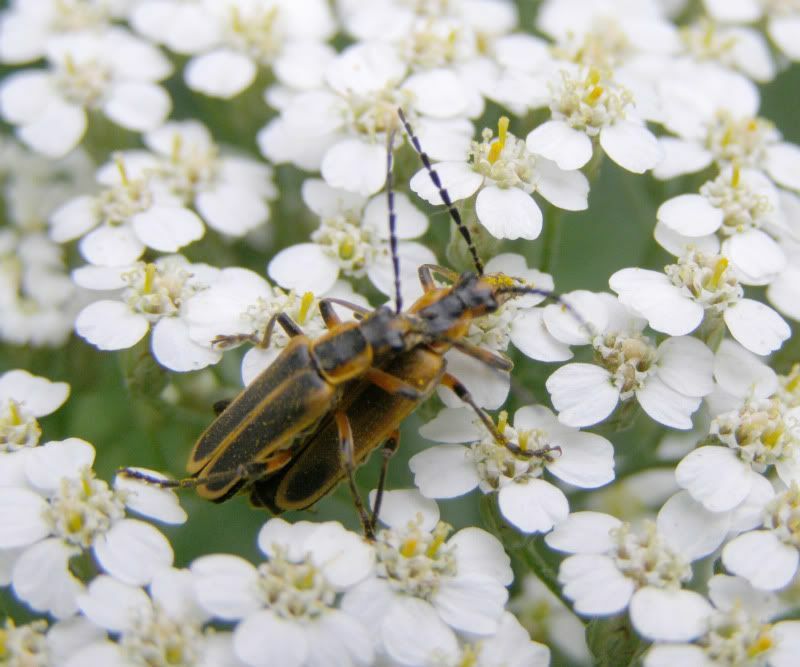 Another insect the Yarrow dragged in, Soldier Beetles are a somewhat unappreciated pollinator. Some species look very similar to lightning bugs, aka fire flies while others are more colorful. They feed on small insects, as well nectar and pollen. However they seem restricted to plants that have flowers they can fit inside of. 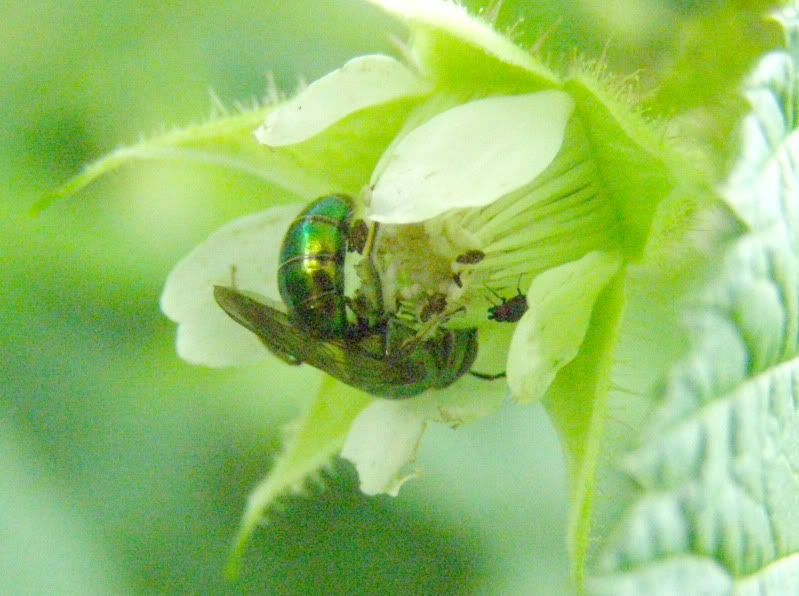 Besides eating the pollen to the plant they also help in pollinating other flowers they may visit. 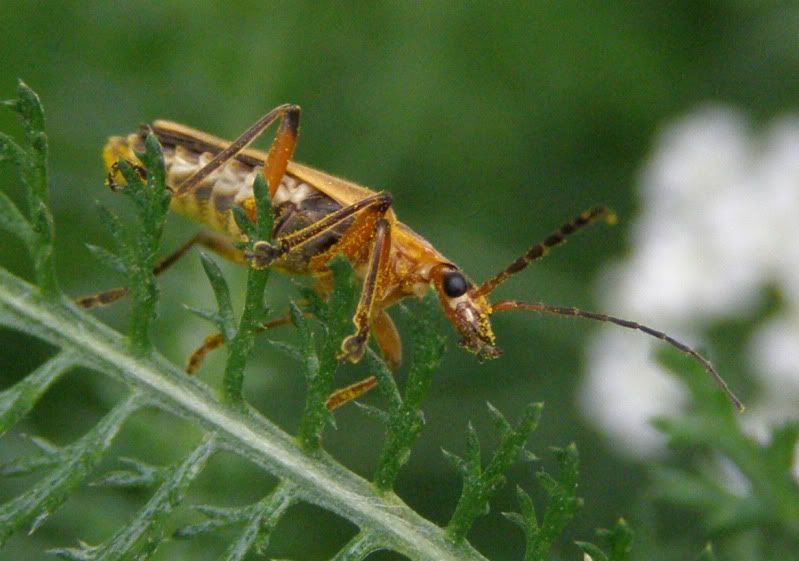 Here you can see the legs to this Soldier Beetle are outlined with pollen, along with it's head and tips of the antenna. Last year the side garden was growing assorted fruits. Among them were 6 tomato plants. They grew quite well but eventually fell over. Tomatoes being a vine-like plant quickly sprouted roots where they touched the earth and by the end of the summer they were easily 25 feet long, growing in every direction and we had we more fruit than we knew what to do with. Let's speed up now to this year. Being a beekeeper and someone who enjoys seeing gold finches every so often it was natural to include sunflowers into the normal rotation of crops. The tomatoes this year were planted in a different garden bed and the sunflowers were planted in the former tomato bed. The sunflowers are growing nicely but about a month after they'd germinated I started to notice this odd weed coming up all over the place. As it turns out one or more of the varieties of tomatoes planted are cold hardy annuals. So now I'm left with some 100+ tomato plants coming up all over the place. My dad being a firm tomato lover refuses to let me weed all of them out. I reluctantly agreed. But then earlier this week I was at the pet store, of all places, when I found the solution to my problems. 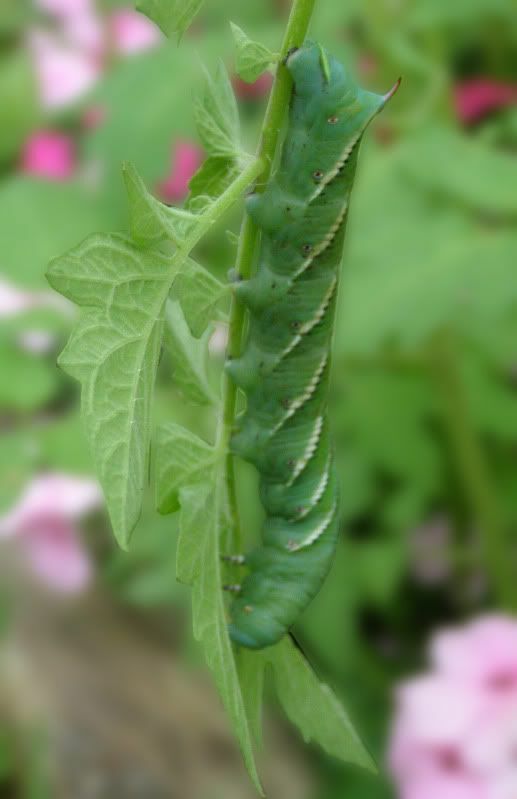 Manduca quinquemaculata, The Tomato Hornworm, a native sphinx or hawk moth very similar to the hummingbird moth in appearance, who's known host plants include tobacco, eggplant, and of course tomato, all on sale for only $1.50 a caterpillar. I bought two! They quickly took to the plants and have already dead headed 4 of the small plants. And are ferociously clearing their way though. Obviously two caterpillars nearing the end of their development won't solve my problem, but hopefully they'll reproduce and I'll get some nice moths out of it. They're blue color comes from a lack of their natural diet. In captivity they're fed something similar to cricket feed which keeps them alive and (supposidly) not poisonous. After two days of eating tomato leaves they quickly green up to their natural pigment. They didn't simply turn green all over in a gradual pace, instead I was able to see exactly where the green pigment was inside the caterpillar as they ate it. It was really neat. When they finally finish their development they'll likely drop to the ground and spin cocoons. I believe they should hatch fully too but I'm not certain on this. Somewhere down the line what I think is a native yarrow came up like a weed. It had such a neat leaf structure, similar to a fern but smaller, so I let it grow some. It also had the added benefit of being somewhere that a plant like this should be. Last year it flowered and I was more or less okay with. I'm not a huge fan of the flowers, it keeps falling over, and overall it kind of annoyed me. But then it flowered this year and though I still have the same feelings about the plant. It has attracted swarms of hover flies. Just droves and droves of them. What's more I see them wondering all over the garden and onto other plants. 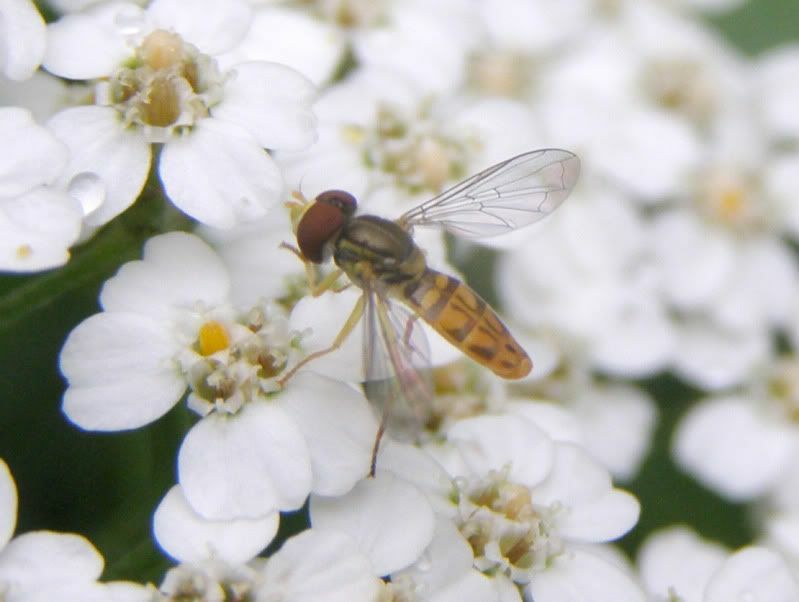 The majority of them though tend to congregate around this one yarrow plant. I suppose this is what marketing means when plants are labeled with "Attracts Beneficial Insects and Pollinators." 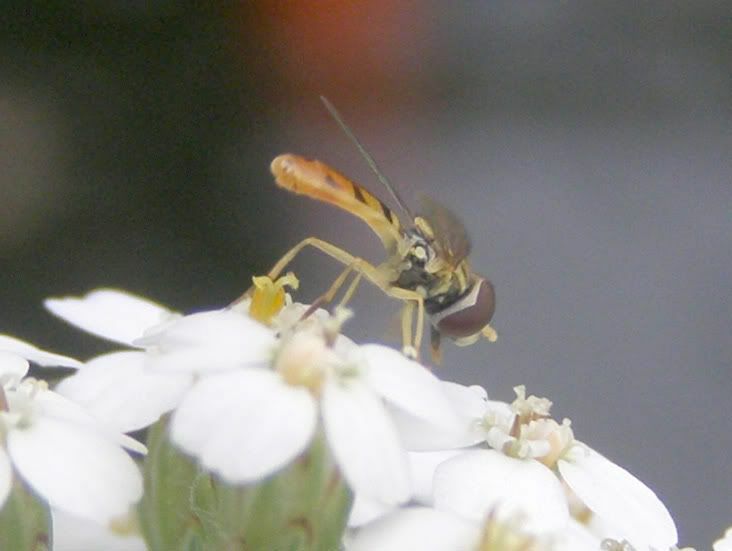 The larval stage to most Hover Flies is actually a predator of aphids. I'm thinking some of these flies are the result of my allowing 14 new trees in the yard to become absolutely infested with aphids. As an update to the aphid "problem" they all up and vanished mysteriously one day. 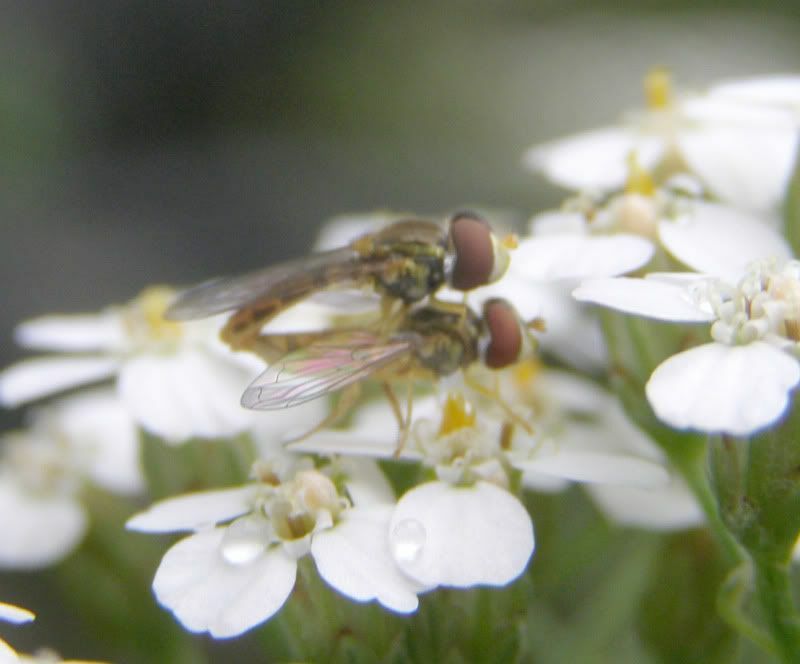 I never learned why but now I have tons of hover flies lightly buzzing around the yard. 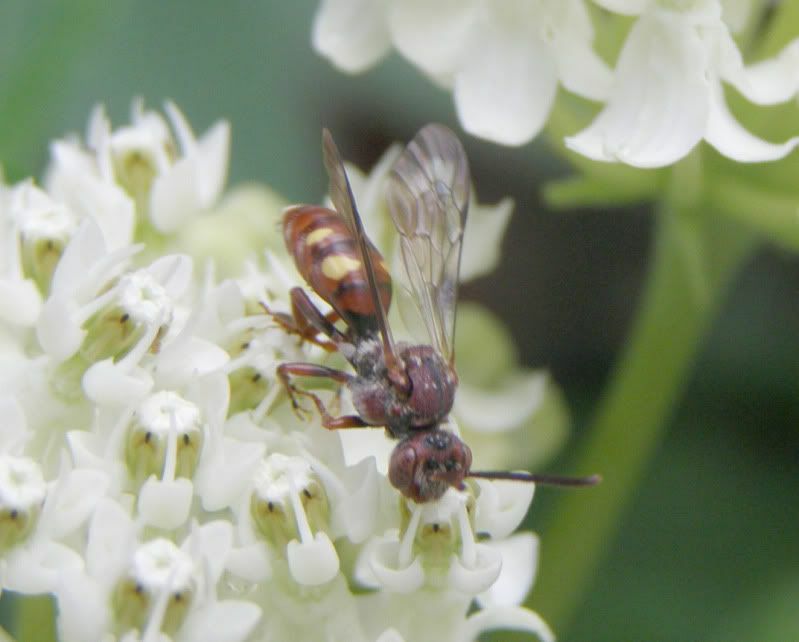 It is difficult to attract pollinators to the garden without the aid of flowering plants. Angiosperms are the most widely spread type of plant life on the earth. Thought some are self pollinating, others take advantage of the wind, but probably the most successful of the angiosperms are those that attract pollinators. 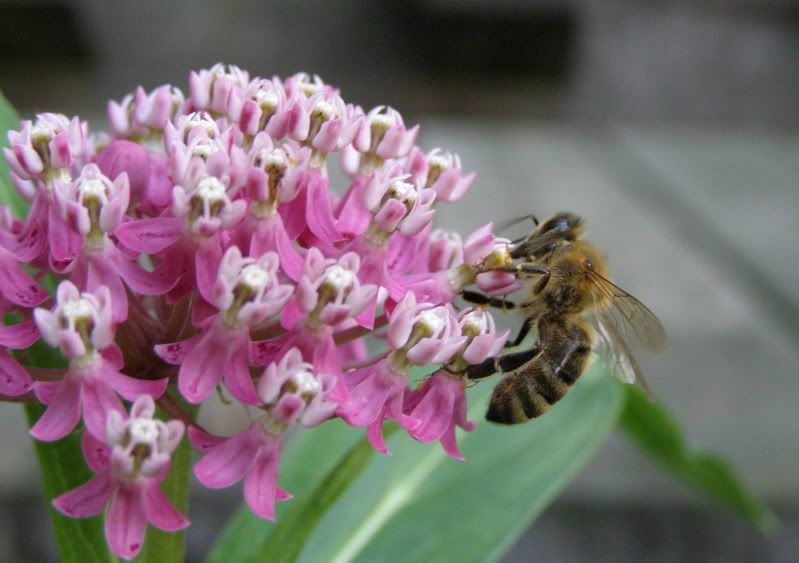 Asclepias, or Milkweeds as they're called, are some of the most popular sources of nectar and do a great job at attracting insects. They're on of North America's great prairie plants. And the bees love them. 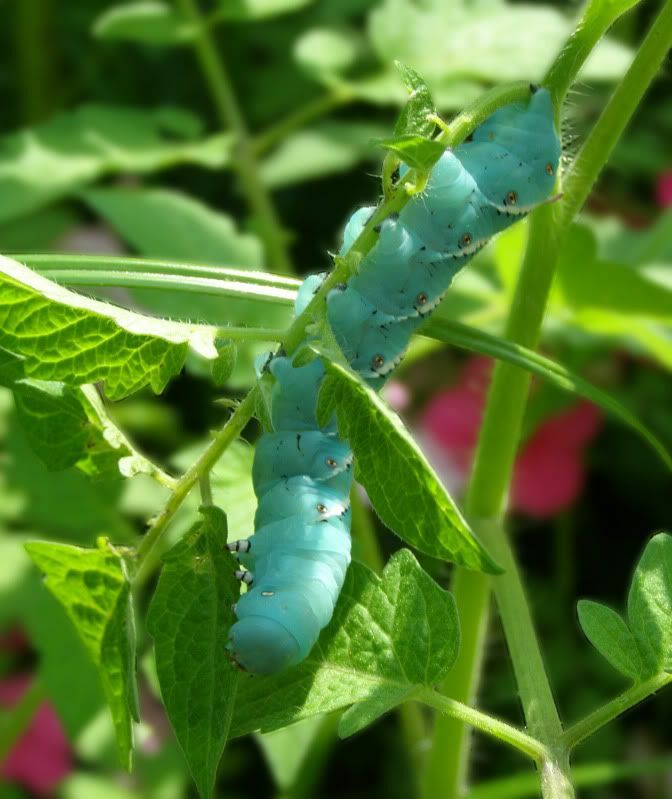 Including some in your garden will have the added benefit of getting Monarch Butterflies to lay their eggs and seeing the caterpillars develop. As a nectar source for Butterflies, well, I can say after 4 years of having these plants (including a variety named Butterfly Weed) I have never seen a butterfly on them! That's not to say it doesn't happen but it is a somewhat rare sight. 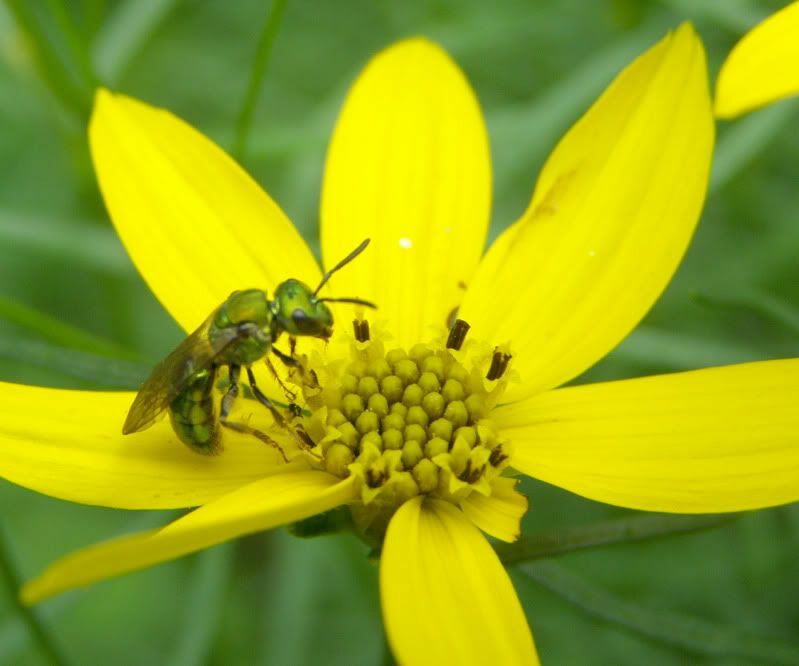 Coreopsis, also called Tickseed, is another native plant to attract pollinators. It doesn't get as many large bees on it though. 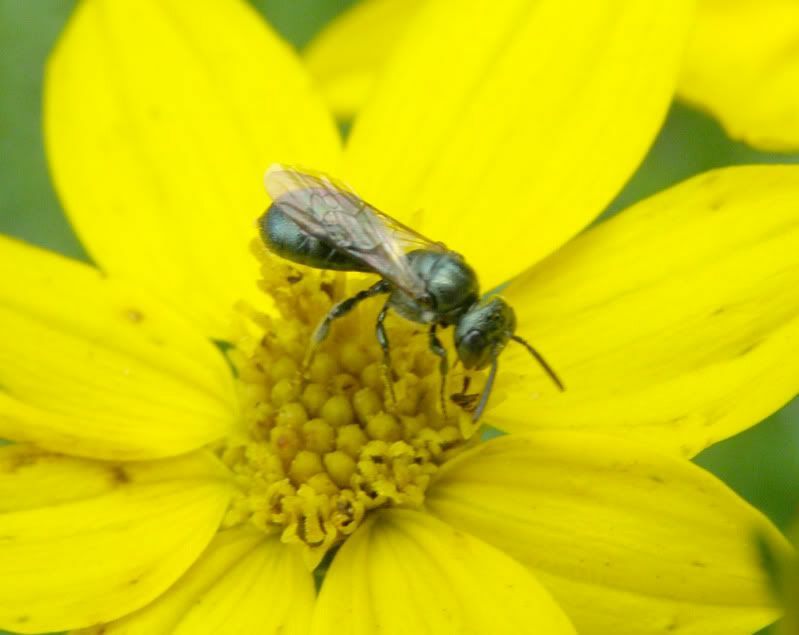 Smaller Sweat bees are far more commonly seen on them. 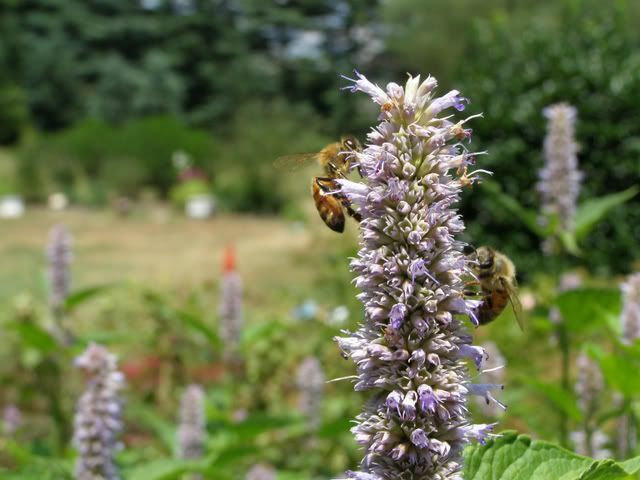 It's always beneficial to attract a diversity of pollinators to your yard. 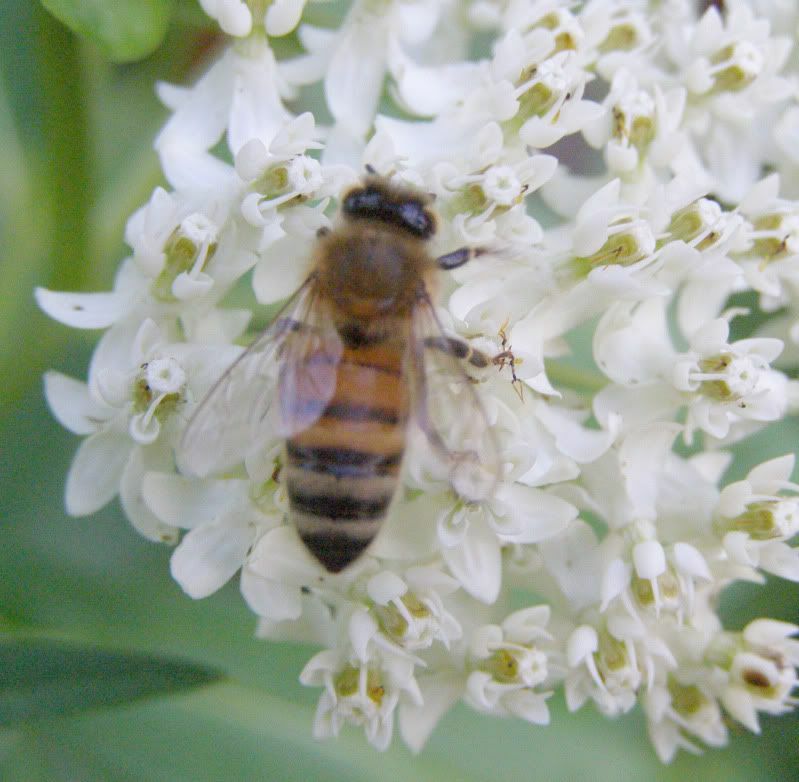 The variety of bee shapes and features helps ensure most plants and their array of flower shapes get pollinated. 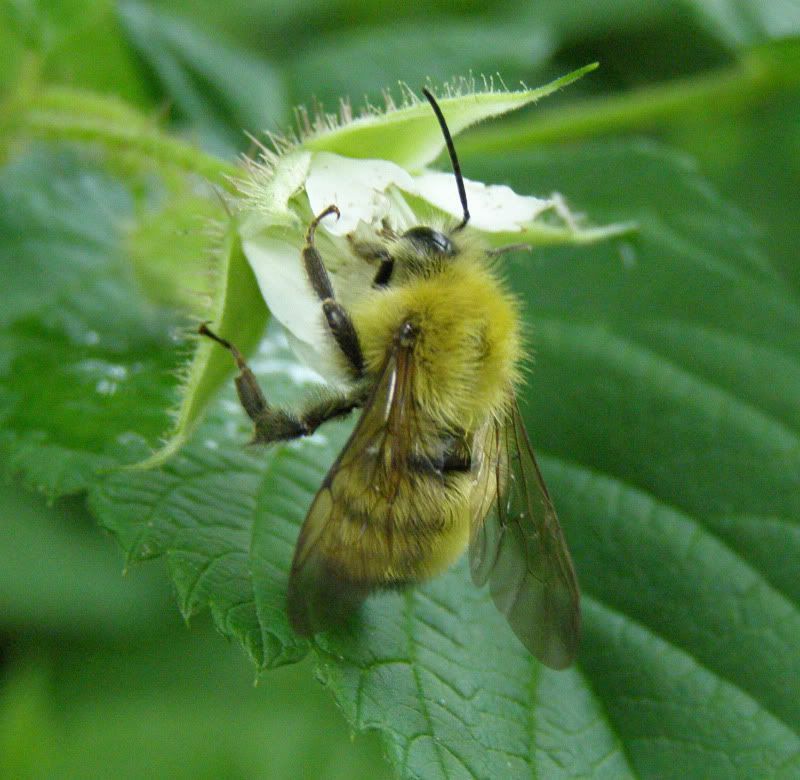 Once you've established your yard as a hot spot of nectar, other plants, such as my raspberries pictured above, will start reaking the benefits. 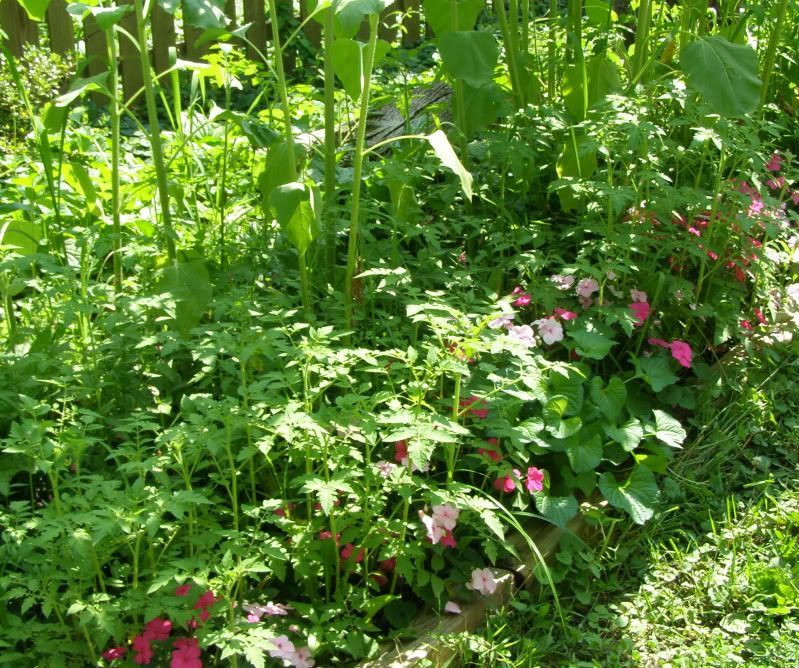 When planted on their own they will produce enough flowers to get pollinators to them, but the added benefits of having more opertunities around will increase the over all number of pollinators. In another week or so I am going to have more raspberries than I'll know what to do with. This is held from June 22 to 28. Look to see what your state has planned in the way of events. 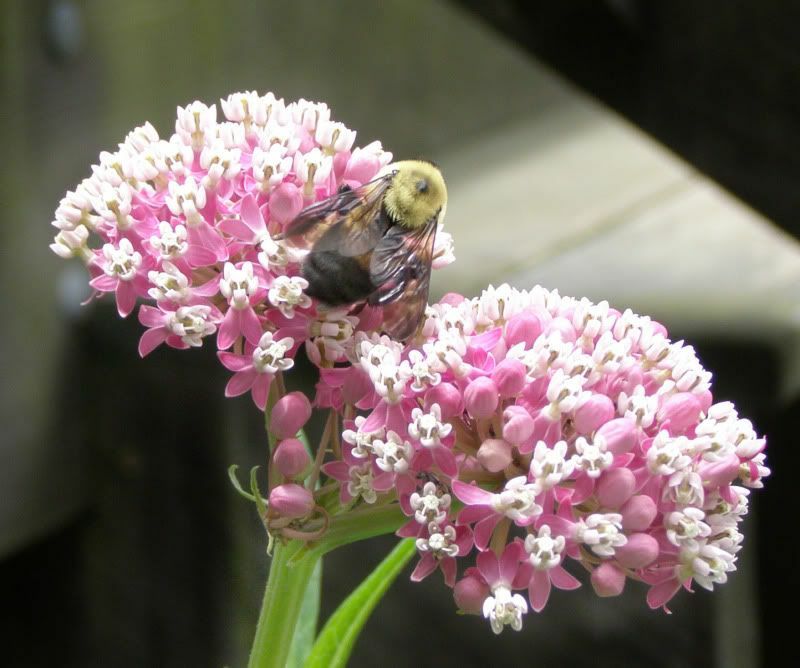 A few flowering plants that are coming into bloom that usually get loads of attention in the way of pollinators are: Yarrow, Milkweed, Joe Pye Weed, Liatris, Hyssop, and Clethra alnifolia. Unfortunately it is raining where I am on and off and I haven't had time to do much in the way of photography. New images are coming. Anise Hyssop, Agastache foeniculum, is a wonderful plant. 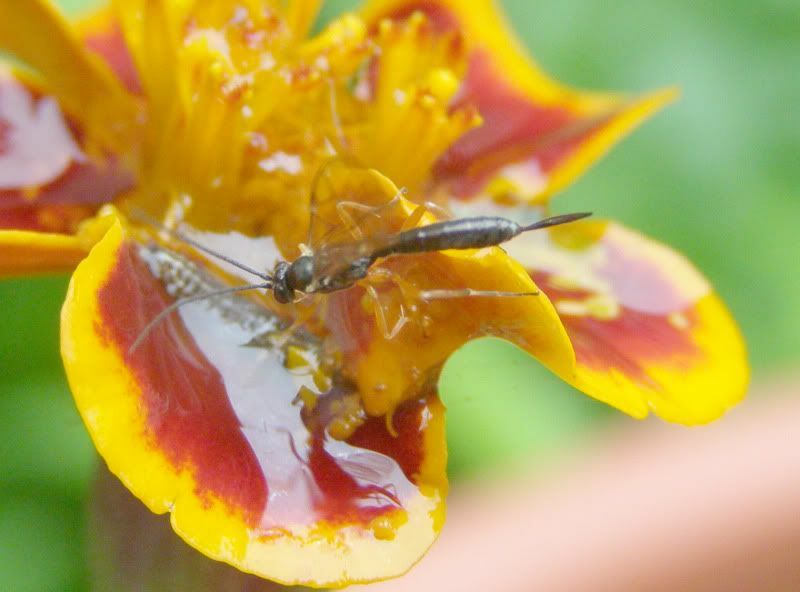 This is one of the most highly recommended and prized nectar plants. At a recent beekeeper's meeting I helped hand out hundreds of these plants which were all pre-orders. They were sold out well in advance. And best of all they're native to North America! Garden centers sell them as butterfly and hummingbird plants and sure enough I bet they'll say that about anything in the mint family. It's prized by beekeepers for a reason. I have occasionally found a butterfly on them, mostly the small skippers, but I'd say hands down bees are the number one insect on these plants. From the moment they bloom, usually in June, they immediately draw attention away form other, somewhat more invasive mint plants. The nonnative Nepita Catmint (usually walker's low) which blooms about a month earlier suddenly loses more than half the bee attention they recieved earlier. Because I'm probably not doing an episode of Ant Chat on this anytime soon, I though I'd do a blog post about how I do it. Your method may vary. Each colony has to be looked at uniquely. Not all of us have the luxury of lifting up a rock and going "oh look there's the queen!" Ideally that's what you want though. You need a colony that's easy to get in some way. Those are going to be the colonies most worth your time I think. 1) Go for something small and easy to get. 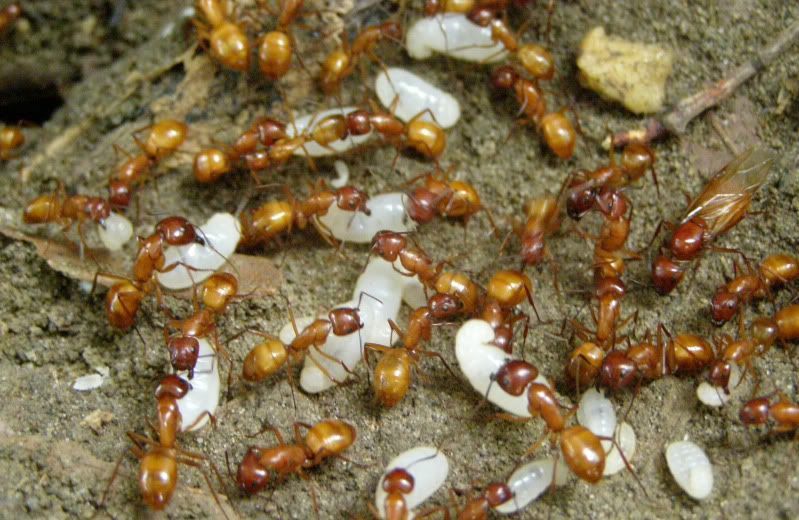 You shouldn't be going after a colony of 100,000 ants. That will take several days. A colony of a few hundred will be much easier to get and probably won't take more than 6 hours to get. .
2) Don't just get the queen, and don't stop when you get her. Your goal should be 100% of the colony. Some are going to die in the process anyhow and you need as much as many ants as you can get! Your eyes shouldn't be bigger than your ant farm. This rule doesn't apply to anything invasive, go ahead and do whatever you like to these! Also if the colony has more than one queen it's find to only take half but make sure you follow rule 3. 3) Don't leave the colony vulnerable. Try to keep it together as best you can. It is fine to take a few workers just as a colony fragment, and it's fine to only take brood to boost an existing colony but don't pick on just one colony. Bait the area if you have to, to find other nests of the species. *And I'll add, if an area is being demolished for construction work feel free to salvage as many colonies as you like. Also try doing some research before hand. For example Here is how most Prenolepis imparis make their nest. As you can see besides maybe the top 6 inches of chambers it's mostly a straight shaft leading some 8 to 12 feet into the earth. There is no way in hell you're digging that up without renting a backhoe. What's more the replete caste is nearly imposable to dig up without crushing even when care is taken. Getting colonies in the spring will be 10 times easier than in the summer when colonies have already started extensively expanding their nests. Some species make foraging tunnels that lead several yards away from the main nest and really spread the colony out. This makes it difficult to locate where the main nest is, but even that doesn't guarantee the queen will be there. Once a suitable colony has been found I like to setup a lightly colored sheet, or some smooth surface next to it. This is so I can dig the colony up, put it on the sheet or surface area and sort through the dirt right there. Some people like to dig up the whole colony, put them in buckets and just drive home with it, but this removes the option of letting the ants go, and who's to say you'll even find the queen? At least when you're sorting ants near the nest site you're able to put the ants back where you found them. 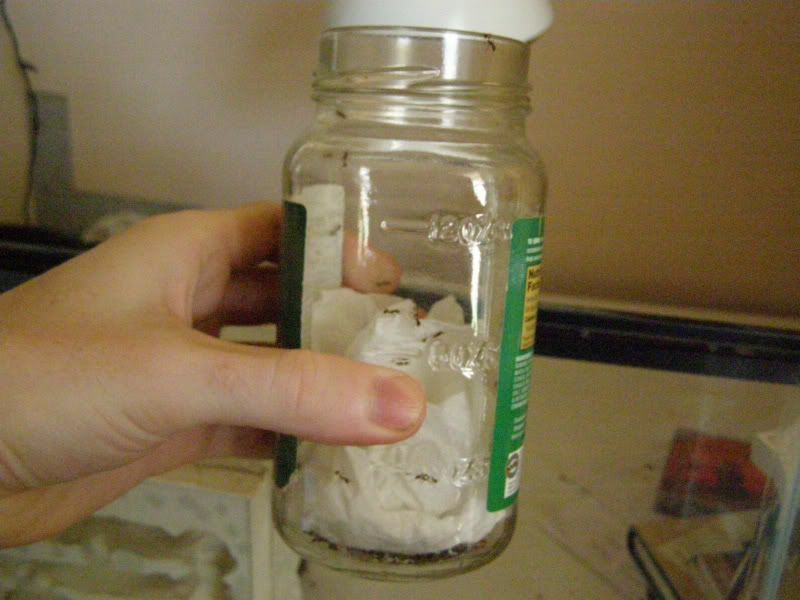 I collect ants in a jar. There is a short piece of half inch tubing sticking through the lid, 1 inch inside the jar, and 1 inch out. (This isn't seen well in the photo above as the lid isn't on properly.) Some people use Pooters or Aspirators and that's fine. Personally I don't like the taste of plastic. Regardless of what you're using though, hands or air, you're going to damage some ants. I've also seen people use open containers coated with Fluon, but that's expensive. I've used 3 in 1 oil before, used in shop class to lubricate saw blades and available at any hardware store, it's a light oil, and that does the job. Some ants in general have trouble climbing glass, but most of them have no trouble at all. Whatever your method of choice may be, I like to put a curled up object in there such as a loosely balled up bit of paper towel, or tissue. This increases the surface area the ants have to work with so when you're dumping ants into a jar they're not restricted to the bottom and crawling all over each other. 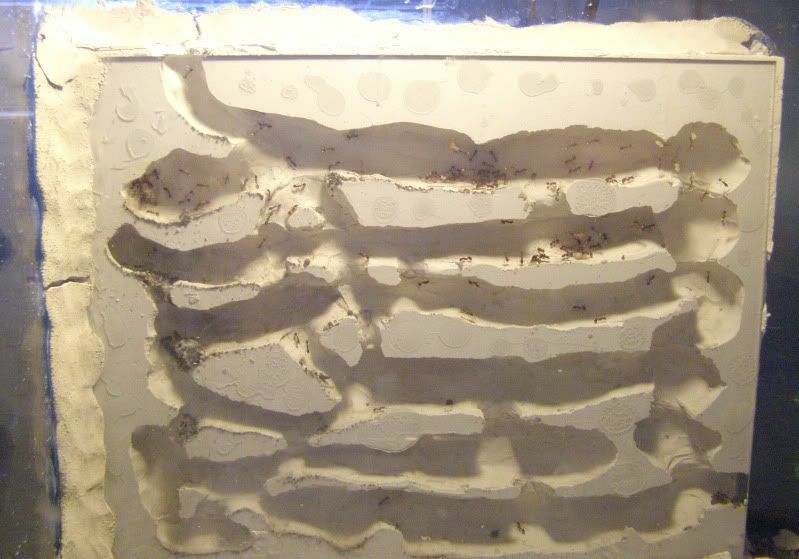 The increased surface area also gives the ants something to crawl around on and hide under. It helps settle them too I find. Over crowding actually damages the ants. 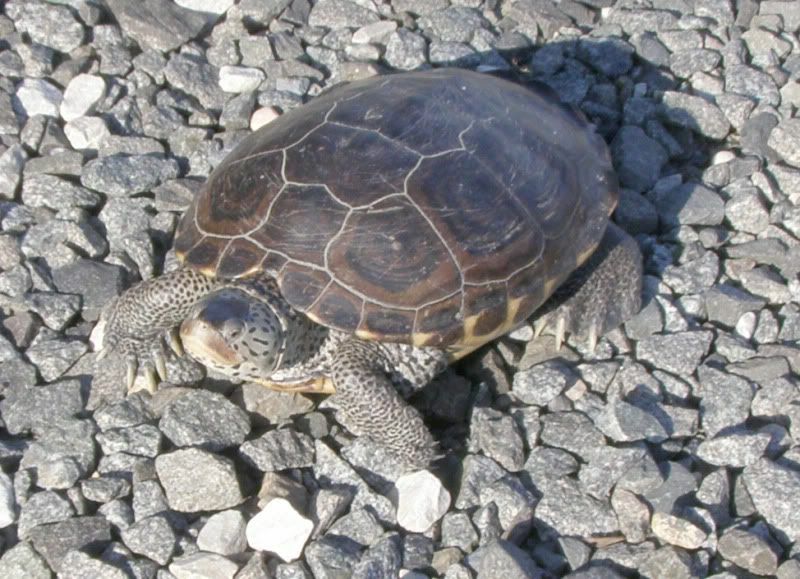 Some species that use chemicals have to be collected with special care! Formica species that spray formic acid will suffocate themselves in a closed jar. I Don't collect ants like that so I don't have an answer for the problem. Formic acid certainly isn't helping your vision if they spray it in your eyes! 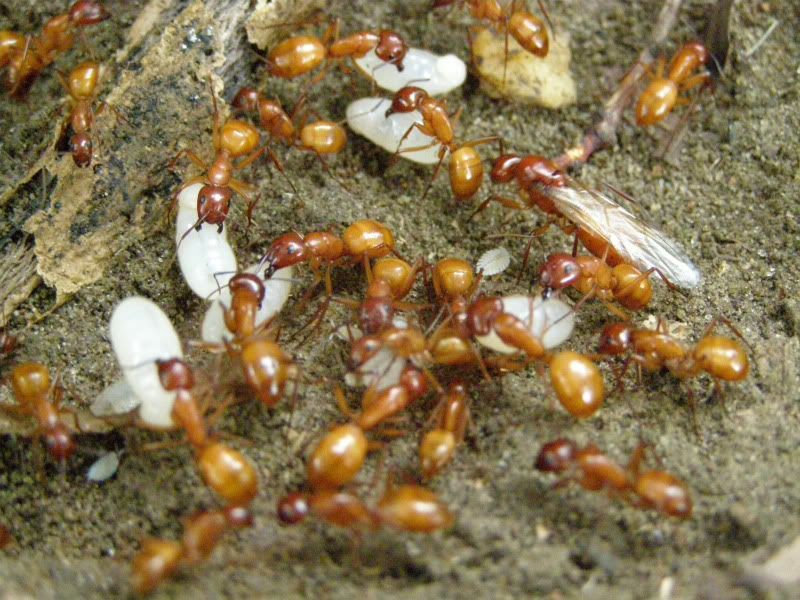 Collect as many of the workers as you can, get all of the brood you find in whatever stages are present (not all ants lay consistently throughout the year) and of course try to locate the queen ant. There's no set location for her sadly but she's usually near the brood. I once found the queen to the Camponotus castaneus colony out in my yard right at the surface guarded only by two workers. C. castaneus colonies build nests that are tangled around the roots of nearby trees they nest next to. This was a huge colony of several thousand ants. Also try to grab bits of the nest, particularly ones near the brood. This also helps calm the workers down some. This helps keep the colony odor steady too. When collecting ants I've seen workers start fighting one another and I believe it's because they don't quite smell correct anymore between me touching them and being thrown into a serial environment of a container that might still smell of the food that used to be in it. Some of their soil, thatch, or, if they've built it, carton nest, help maintain order I think. When you first start digging, try to get all the ants that run away first. The ones that didn't run are bunkering down inside the clump of dirt. I usually sort through the dirt twice to make sure I haven't missed any, then toss the pile to the side. The ants usually cluster around the brood above all else, and occasionally a few will just make a break for it running in all directions. Get as many as you can and pray you haven't chopped the queen in half with the shovel; which has happened to me twice! Something that occasionally happens is neighboring colonies will catch on that your current excavation is vulnerable and they'll take advantage of a free meal. You may see lots of other ants suddenly show up. There isn't much you can do about this other than try to move quicker. So that's pretty much what I do to get a colony. As I said I usually go after something small and easy to get. I'm also careful not to mess with to many species that sting. You don't want to find out you're allergic to an ant sting after you've pissed off thousands of them. While visiting my brother, who lives near the Jersey shore, I noticed some sort of turtle in his driveway. 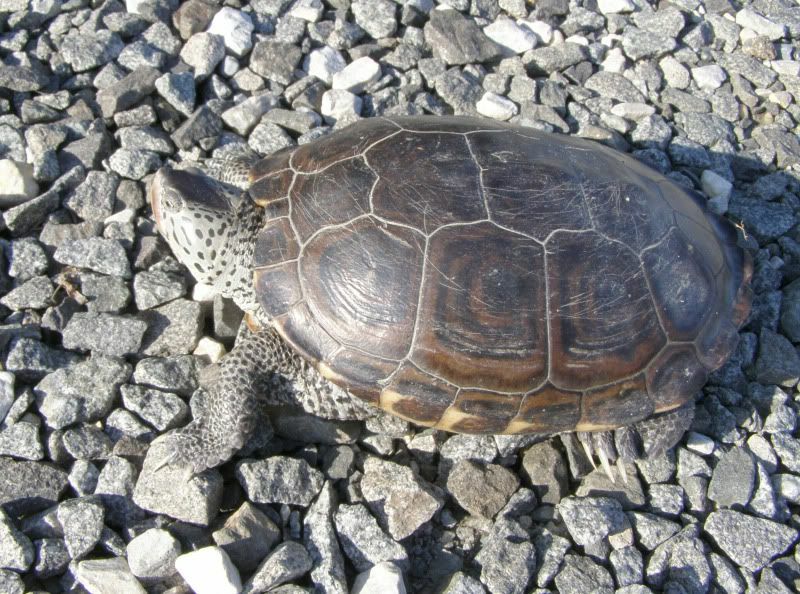 This is well out of my field but I can say at least that it's probably not a sea turtle from the fact it has claws similar to a box turtle. It does live in salt water though or whatever the content of the nearby bay would be. When the moon is full they come to the shore to lay their eggs. This one was being pecked at by the neighborhood Guinea Hen, natures car alarm. Those awful birds don't know when to shut up. If you disturb one they will belch out a continuous tone of stretching for at least one hour. I'm told there used to be 6 of these Guinea Hens running around and assuming the neighbor's didn't have something to do with it I'm sure the numerous owls and eagles did. 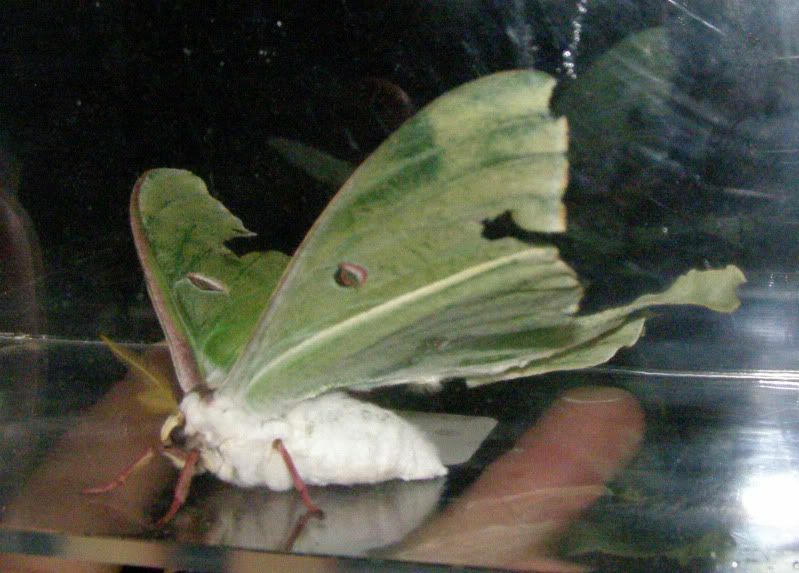 Giant Silk Moths Are Here! 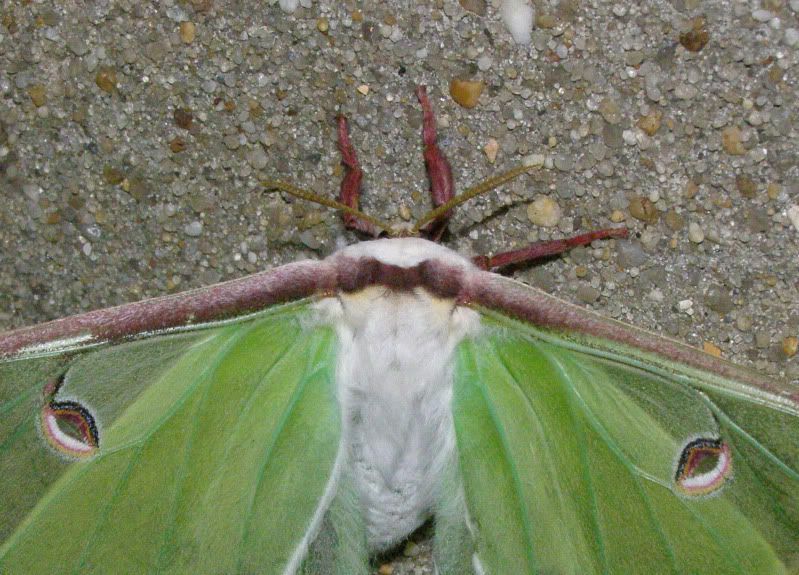 Behold the Luna Moth. Some people have called this the prettiest insect in all of North America. This little guy has a nice 4 to 5 inch wingspan, is lime green in color, and sports two purple colored eyes on the wings. 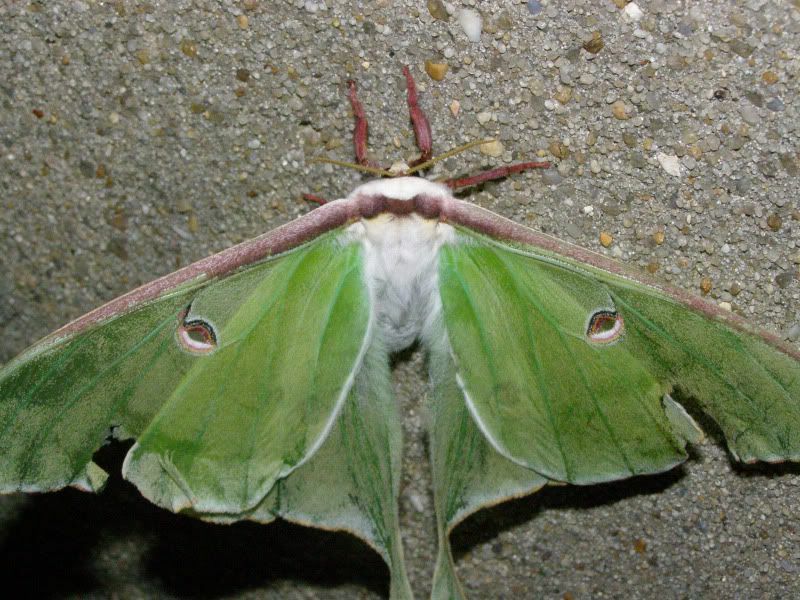 I'll be focusing on these for this post but all across America these giant silk moths maturing such as the The Imperial Moth, Honey Locust Moth, IO Moth, and Polyphemus Moth. 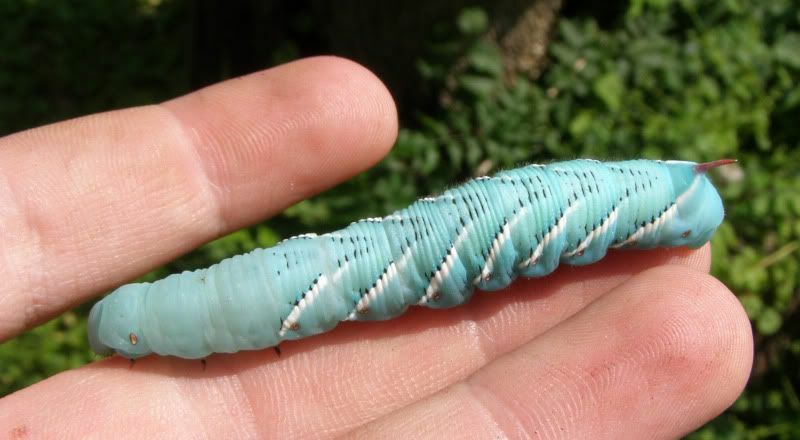 The Hickory Horned Devil is another one that's endangered. Though present across the east coast, it's no longer found in the new england area (eastern New York and everywhere above). This is likely because of to much stress on it as well a shorter period to develop. I found this under a light one day behind the place that I work. It's something of an insect hot spot my little walk to the car. Ya see at night time the parking lot lights come on and one light in particular, right where I park my car, is incredibly close to the wall. The light hitting the wall makes it illuminate and makes it the brightest spot around despite dozens of other lights. And this is sort of the reason why these moths aren't more common. They spend all their time at lights at night instead of doing what nature intended. 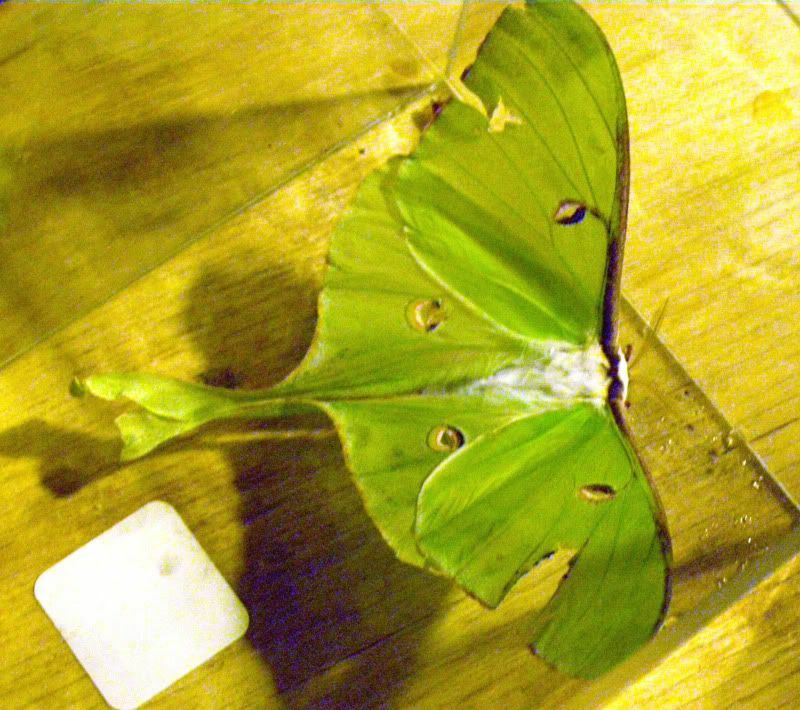 The adults to these moths only live 2 to 4 weeks and then they die. The adults don't even eat, all the energy they gathered was done during the larval stage. So I carefully collected it, with special care to not damage the wings. This is where I started photographing it. By the way I don't recommend doing that. If you find one, admire it and take pictures if you like but after you're done kindly sway it away to a darker place like a forest. The car ride home was also fun as the thing crawled up my shirt while driving. And went up my face blocking my few with one eye thanks to it's pretty wings. Now you may notice it has wing damage already. Sure enough I did notice the left wing was damaged when I found it, but the right one I can't vouch for. On another forum I'm told it's likely that both wings were damaged while emerging from it's cocoon. Notice how the damage is on the same spot on both wings. So that's a relief to me. I released it outside and was happy to see it could still fly. 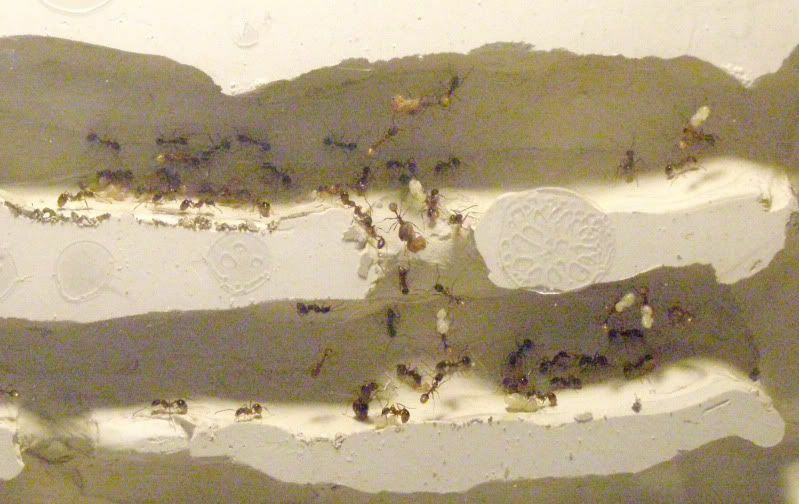 For those of you keeping track with my podcast Ant Chat you'll know that I keep a young colony of Aphaenogaster. The exact species is unknown to me and I haven't really put any time into trying to either. Aphaenogaster has a couple of Complexes in it. I thought I'd take the time to write about them for a bit. Something interesting about this ant is queens don't lay eggs over the winter, however there is still brood in the nest. This over wintering batch of eggs was laid in late summer or fall and takes a full three seasons to develope. Other batches of brood, which I call "normal" brood, is laid over the spring, summer, and fall and doesn't take longer than 3 months to develope. However, it's only the batch of brood that over winters and takes roughly 9 months to develope that can turn into new queens. Even then, the brood can still develope into workers and males. In the photo above you can sort of make out a new queen in the final half of the pupa stage right in the middle of the image. Though the colony is small they will soon expand to other parts of the nest. It's good to give a colony options I think. Mostly all of the ants stay inside the chamber in the upper left. You can make out some walls and bridges they've built in the area below this room. I would say the colony only has 100 ants in it but new pupa are already developing and the colony will grow quickly.